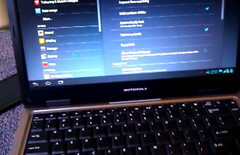 Motorola’s WebTop platform released earlier in 2011 lets the users to connect supported Smartphones into a docking station, that makes the setup looks like a laptop. This also provides a keyboard and a larger display. The software allows the devices run on Google Android platform while the others hold their Smartphones in hands and when connected to the laptop and dock the transforms to Linux. With the Linux the customers were also able to browse the web in a Firefox browser and can also use the address book as well as the phone dialer. Although nothing much was offered Apart from these basic functions, but now it seems like Motorola are not much dedicated in using two platforms for both the modes. The next version of the WebTop software may look like Android 4.0 while running in both the modes. It will be using the Android Web browser and other applications on the laptop sized screen. According to a video posted on YouTube, the phone to a laptop is docked to an Android 4.0 where we can see the familiar Android home screen with settings menu and web browser as well as a list of all the applications installed on the phone. Although the fact is most of the applications doesn’t support a larger screen so have issues with running on the docked Webtop 3.0 version, as most of them are designed for smaller displays? However you need not have to switch between different user experiences while docking and while holding the phone in your hands. Till now there has not been any kind of official release of details regarding the new software. 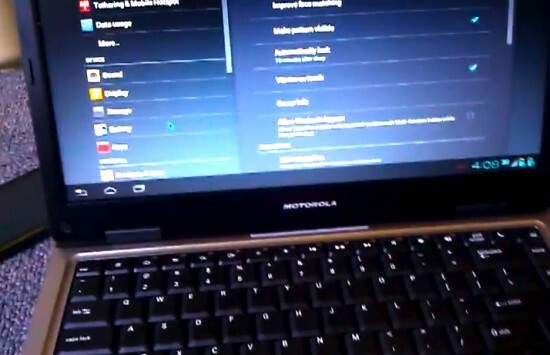 The video uploaded only shows a leaked beta version of Motorola Webtop 3.0.